Pentywyn Bed and Breakfasts. Compare latest rates and Live availability for all your favourite places and places you have always wanted to go using our new My Shortlist feature. Click + to add to your Shortlist. Bed and Breakfasts in Pentywyn, Dyfed for 1 night from Wed Apr 24, 2019 to Thu Apr 25, 2019 within 10 miles, in an Average Nightly price range of £1 to £200. Featuring free WiFi, Pods at Broadway offers accommodation in Carmarthen. Carmarthen Castle is 16 km from the property. The accommodation features a flat-screen TV. There is also a kitchenette, equipped with a microwave and toaster. A fridge and stovetop are also offered, as well as a kettle. Certain units feature a hot tub. There is a private bathroom with a shower in each unit. Towels and bed linen are featured. Pods at Broadway also provides a barbecue where guests can purchase a disposable barbecue on-site to place on top. Guests can enjoy a meal at the on-site restaurant. The nearest airport is Cardiff Airport, 89 km from Pods at Broadway. Welcome to Pods Broadway br / br / br / br / Explore Relax and Enjoy br / br / br / br / Set in the grounds of Broadway Country House in West Wales our glamping pods are a great alternative to camping. Relax in the surroundings of coastal West Wales near the sea and the village of Laugharne (made famous by the poet Dylan Thomas) where you can explore nearby attractions head out for walks on the Wales coast path or head to the coastal towns of Tenby and Saundersfoot. br / br / br / br / Our 10 Self contained pods sleeps 2 and an additional 1 or 2 guests can be added (additional cost) a bathroom with shower small equipped kitchen area and balcony area to relax on an evening. Four of our pods also featuring a hot tub on the decking for that additional bit of luxury. br / br / br / br / Our pods ensure that you can just turn up and enjoy your holiday from the minute you arrive. br / br / br / br / Head out and explore the local area and then head back to your cosy pod and cook a family bbq or make the most of our pizza menu or restaurant menu at nearby Broadway Country House and avoid the cooking all together. A restored Victorian country retreat on the outskirts of the historical township of Laugharne: famous for Laugharne Castle and more recently Welsh Poet Dylan Thomas who did much of his writing in the boat house. The hotel has the benefit of being situated on the cusp of Pembrokeshire and Carmarthenshire which means all the wonders of West Wales are on your doorstep: including Pembrokeshire National Park Local them parks Picturesque beaches Rugged countryside and Pendine sands - the home of many land speed records. Broadway Country House is set within 6 acres of woodland with breathtaking views out over the Carmarthen Bay and beyond to Devon. The hotel buildings originated 300 years ago with a new West wing and Orangery being added in 1914 which has recently been refurbished. A family run hotel which specialises in weddings and functions with an experienced and energetic team who take great care and pleasure in making your special day everything you could dream of. Laugharne - Laugharne Castle a historic medieval castle where poet Dylan Thomas wrote in the Gazebo. Dylan Thomas boat house is nearby which attracts visitors from all over the world. Pendine Sands - where many land speed records are held. Tenby - is a town which is steeped in ancient history surrounded by an imposing stone wall built in the 13th centuary. Through the passages of time Tenby has seen many changes. Hidden in the marshlands of the Carmarthenshire countryside, The Corran Resort & Spa offers a bar and an a la carte restaurant. Featuring a luxurious spa, it also boasts a swimming pool, and gym. The boutique Corran Resort offers a range of accommodation, including rooms, suites, and luxurious cottages. Each includes a flat-screen TV, a hairdryer,hot tub, and a bathroom with complimentary toiletries and slippers. Free Wi-Fi is available in public areas. With a creative menu, the restaurant serves seasonal dishes with Welsh character. Dishes are prepared using fresh and local produce. The town of Laugharne is an 8-minute drive away and offers pubs and boathouses. Dating back to the 16th century, The Corran Resort is steeped in history. It is surrounded by the ocean, the Towy estuary, and acres of marshland. The Pendine Sands Beach is just 20 minutes' walk away. The property offers free private parking. Located with 20 acres of land, Picton-House is a period property in Camarthenshire. Free WiFi is accessible throughout, and free parking is possible at the property. Picton-House is an inn with a classic design. Beautifully varnished wood furniture sits alongside the neutral tones of the bed linen, all brightly lit by the rooms' large windows. Rooms are en suite, some with a bath and others with a shower. Each room comes complete with a flat-screen TV. A full Welsh breakfast is included in the room rate. The area is surrounded by fantastic woodlands walks and is close to Laugharne, the former home of the famous poet Dylan Thomas. The beach is less than 6 miles from Picton-House. The property offers stabling for guests who wish to bring a horse. Gwynfryn Guest House is a large handsome detached home standing in its own grounds complete with ample private parking. We have modern fresh bedrooms all en suite with stunning countryside and distant coastal views on the south side to views of the Preseli Mountains on the North side. It’s an ideal central location to find award winning beaches and a multitude of attractions. Gwynfryn Guest House Tavernspite Pembrokeshire is a non-smoking establishment. Situated in Laugharne, close to the River TÃ¢f estuary, this boutique hotel is known as the favourite watering hole of Dylan Thomas. Free Wi-Fi is available in some areas and there is free, limited parking on site. Rooms at Browns Hotel have elegant dÃ©cor and some feature period features like old wooden beams and exposed brick walls. Benefits include an HD TV, iPod docking station, and en suite bathroom with free toiletries. You can relax in the reading room beside an inglenook fireplace, or enjoy a drink and listen to mellow music in the bar that Dylan Thomas visited. The spectacular coast at Tenby is a 30-minute drive away, and Swansea is less than an hour's drive away. Hills Farm B&B Laugharne is set in Laugharne. Free WiFi is offered. A patio with garden views is offered in every unit. A Full English/Irish breakfast can be enjoyed at the property. The bed and breakfast offers a terrace. Guests can relax in the garden at the property. Tenby is 34 km from Hills Farm B&B Laugharne, while Carmarthen is 21 km from the property. Julia and Stuart offer you a warm welcome to their lovely guest house where you can unwind and relax in the garden lounge or conservatory all of which have country and sea views. Enjoy complementary tea and cakes on arrival as you watch the wildlife and their daily antics. br / br / br / br / The Bed and Breakfast is open all year is non-smoking and all our rooms are en-suite. We offer traditional home cooking with a full cooked Pembrokeshire breakfast plus cereal toast orange juice yogurt fresh fruit or continental breakfast. Special diets are catered for. Sorry we do not have family rooms therefore only take children over 12 in their own room. br / br / br / br / Tenby is an exceptionally busy seaside town in the Summer and is visited by tourists coming from all over the British Isles and beyond. Its relatively unspoilt beaches which have received European Blue Flag awards and the well preserved historic town walls make it a unique seaside resort. Many of the shops pubs and restaurants in Tenby are taking particular care to appeal to the visiting tourists providing a unique atmosphere especially during the summer months when much of the town centre is pedestrianised. br / br / br / br / There are many places to visit close by including Colby Woodland Garden (a short walk away) many castles including Pembroke Manobier and Narberth and if you just want to relax then you can choose one of our many picturesque beaches. Llety Cynin is a 4 Star Rated Guest Accommodation. The converted coach house has been transformed and now comprises 13 high quality beautiful en-suite bedrooms decorated and maintained to the highest standard. Breakfast is freshly cooked to order and includes fruit juices pastries cereals toast yogurt fruit and a range of hot meals from our breakfast menu. For business we have the Conference room available for private hire. Our facilities are able to cater for day long Meetings Functions Team Building Courses Conferences and more. Residential Conferences are ideal. Our aim is to make your business event even more special. To round off our superb facilities we have the Llety Cynin Leisure Club & Spa comprising a 40 foot Swimming Pool with counter current Spa Pool Sauna and state-of-the-art Gym. Spa treatments available to book. There are a range of Tourist Attractions including the National Botanic Garden of Wales Oakwood Theme Park gorgeous Pembrokeshire beaches within a short driving distance with the Cities of Swansea and Cardiff close enough for a day trip. Llety Cynin is a bed and breakfast located on a working dairy farm, 1.3 miles from St Clears. The bed and breakfast offers guests ample free parking and WiFi, and use of on-site leisure facilities. Each bedroom features an en suite shower with a hairdryer and complimentary Neal's Yard toiletries. Bedrooms offer a TV and radio, tea and coffee making facilities, and some bedrooms include a DVD player. Breakfast is served each morning and includes Continental and cooked options, including locally sourced Welsh sausages. Guests are also able to enjoy beers and wine in the on-site bar. Guests have complimentary access to the Llety Cynin Leisure Club, complete with a 40-foot swimming pool, spa pool, sauna, gym and weights room. Meeting facilities are available to pre-book. With garden views, The Forge Restaurant and Lodge is set in St Clears and has a restaurant and bar. Complimentary WiFi is offered. A Full English/Irish breakfast is available daily at the property. The wellness area at the lodge is comprised of a sauna and an indoor pool. Tenby is 30 km from The Forge Restaurant and Lodge. Conveniently situated by the side of the main A40 at St Clears in its own extensive grounds and private car park the Forge Lodge and Restaurant sits at the gateway to Pembrokeshire and West Wales. The Forge has 18 modern ground floor lodges situated behind the restaurant in our extensive grounds. Free Wi-Fi is available to all guests. Rooms are all en-suite with power showers spacious and comfortably furnished. They are all equipped with free Wi-Fi Freeview TV tea/coffee making facilities and direct dial landline phones. /p The restaurant has established a reputation over half a century for quality home cooking. The bar take orders for food up to 9.30 pm throughout the year. /p Our leisure facilities including heated swimming pool sauna and gym are available for the use of our residents at no extra charge. /p Cots high chairs and aids for disabled guests are available. Harbourlight Guest House is open all year. 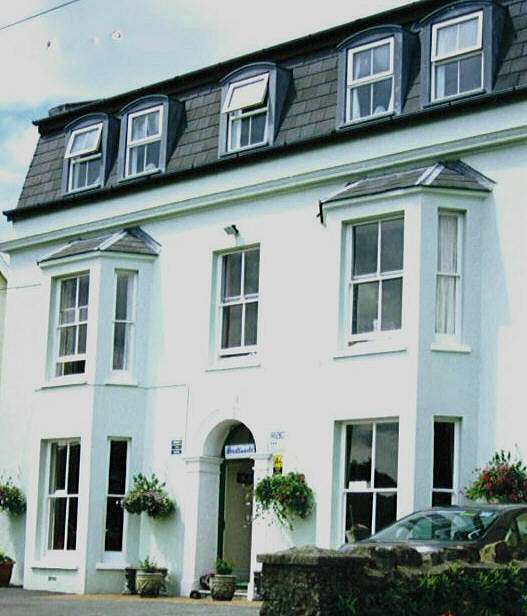 Based in the centre of Saundersfoot with Free Wi-fi in all rooms and flat screen Freeview television. Some rooms have baths as well as showers so please ask when booking if required. In the National Park's seaside village of Saundersfoot, this family-run guest house is a 2-minute walk from beautiful beaches, the harbour, restaurants and shops. Harbourlight Guest House is run by Steve and Amy, who are friendly and helpful. Breakfast is available from 08:15 each morning. Collection from Saundersfoot Rail Station or the coach stop can be arranged. Harbourlight has a secure area for bikes. Hotel of the Year Wales - Visit Wales Awards 2018 Best Hotel in Pembrokeshire Pembrokeshire Tourism Awards 2018 5 Bubbles with the Good Spa Guide 2018 Tourism & Hospitality Business of the Year Swansea Bay Business Awards 2017 Best Room with a View Best Loved Hotel Awards 2017 St Brides Spa Hotel is privately owned and the highest rated four star hotel situated in Pembrokeshire s National Coastal Park. The hotel has dramatic coastal views over Saundersfoot harbour beach and coastline. Our luxury cliff top Marine Spa and Thermal Suite which includes a steam room salt room rock sauna adventure shower ice fountain and infinity edge salt water hydro pool has stunning sea views. The Marine Spa offers exclusive treatments using seaweeds salt clay and marine muds. Treatments can be enjoyed in our double or single treatment rooms as requested. A 90 minute bookable session in our Thermal Suite and Hydro Infinity Pool is offered complimentary for our resident guests. it is essential that all treatments and Thermal Suite and Hydro Infinity Pool sessions are booked in advance of your stay to avoid any disappointment. The Cliff Restaurant provides superb unbuttoned fine dining serving local seasonal produce with fresh fish always on the menu. All day dining is available. Each of the bedrooms is individually designed with a light airy seaside theme throughout. Many of the rooms have individual balconies with stunning seaside views. The Contemporary Art Gallery at St Brides Spa Hotel shows paintings from leading modern artists. St Brides Spa Hotel is a member of Welsh Rarebits Independent Hotels. Marine Spa Terms and Conditions: It is important for us to know if you are pregnant have undergone recent surgery or received medical treatment. If you fail to notify us prior to your visit of pregnancy or a medical condition we reserve the right to refuse offering the requested treatments or Thermal Suite and Hydro Pool Sessions and charge for the time reserved. The Thermal Suite Marine Hydro Pool and Treatments are available to guests that are 16 years and over. The Gower Hotel sits just back from Saundersfoot s vibrant centre - the ideal spot to escape for a touch of peace and quiet yet close enough to step right into the life of the resort. Comfort and quality are the key notes of the decor a theme which extends to each of our 20 en-suite rooms some of which have balconies and some of which enjoy views across the bay. br / br / br / br / We have a choice of twin double and family rooms all equipped with tea and coffee facilities colour TV telephone and modem connections. br / br / br / br / In addition we have we believe put together a team of people qualified professionals who are as committed as us in a desire to exceed the expectations of our guests and to make a success of our business. br / br / br / br / Our aim has always been to create an atmosphere and ambience in our hotel that we would desire for ourselves if travelling a relaxing environment with a certain restrained style a place with a warmth of feeling a place where you can enjoy some time that you can genuinely call your own. br / br / br / br / We hope you enjoy your stay with us. The Begelly Arms Hotel is situated in the heart of Pembrokeshire a short drive from Tenby Saundersfoot and Pembroke to name but a few. Whether you choose to spend time enjoying the beautiful local beaches taking a walk along the Pembrokeshire coastal path or enjoying the picturesque harbour in Saundersfoot The Begelly Arms Hotel is the ideal base for your holiday. br / br / br / br / The hotel is central to all the main attractions including Oakwood Folly Farm Heatherton Manor House and many other exciting venues. br / br / br / br / All our rooms are en-suite and are complete with LCD TV tea and coffee making facilities with biscuits fresh towels and complimentary bath and shower gel. br / br / br / br / The hotel also boasts ample on-site parking facilities and free WiFi is available throughout the premises. br / br / br / br / The restaurant serves breakfast lunch and evening meals with it s menu showcasing only the finest of Pembrokeshire s local produce. br / br / br / br / Every member of our team takes pride in offering the highest standards of Welsh hospitality and our professional service ensures that you make the most of your time here with us. Manian Lodge is set in the heart of Pembrokeshire countryside yet only 2 miles from the coast this cosy 4-star guest house has free on-site parking free Wi-Fi and a Resteraunt that offers home-cooked meals. Manian Lodge is set in the heart of Pembrokeshire countryside yet only 2 miles from the coast this cosy 4-star guest house has free on-site parking free Wi-Fi and a restaurant that offers home-cooked meals. Manian Lodge is a small country guest house with self catering accommodation situated in Pembrokeshire West Wales. We are open all year and are the ideal venue for both tourists and business travellers. Manian Lodge is also an excellent venue for parties weddings business meetings and seminars. We are in the enviable position of being situated on the edge of Britain s only National Coastal Park which provides us with breathtaking scenery spectacular beaches and a magnificent coastline. We are 5 minutes from Saundersfoot and 5 miles from Tenby. The local village of Kilgetty provides the usual shops and amenities whilst Tenby and other neighbouring towns offer a variety of leisure activities. Oakwood Bluestone and a number of other local attractions are within easy reach and Folly Farm is only a stones throw away. Our fully licensed bar and restaurant is open for a relaxing drink or a meal in our restaurant. A warm welcome awaits both residents and non-residents alike. Breakfast is served between 8.30am and 9.30am. Please Note: All our rooms are Non-Smoking Regrettably we cannot accept pets. Children welcome. Check-In time: 1400 and Check-Out time: 1100. The self catering apartments are not graded by the A A or Visit Wales Please note that our restaurant is closed on Sunday evenings. Located in the heart of the Pembrokeshire countryside, yet only 2 miles from the Pembrokeshire coastline and the popular seaside town of Saundersfoot, the privately owned Manian Lodge offers 4 star guest accommodation set in picturesque surroundings. It features a restaurant offering home-cooked meals, bar, terrace and gardens. Each room comes with a flat-screen TV, a wardrobe and complimentary refreshments including bottled water and Welsh cakes. WiFi is available throughout. They also have en-suite bathrooms with complimentary toiletries. Some rooms also boast a view of either the gardens or countryside. Manian Lodge has easy access to all local attractions, including Tenby and Oakwood, which are both 5 miles away, and Folly Farm Adventure Park and Zoo, just 0.5 miles away. Rose Cottage Tenby - bed & breakfast is situated near Tenby just outside the small village of New Hedges. We are ideally situated for coastal path walks. Over 150 years old this former Welsh farmhouse with its carriage house stable grain store and milking parlour was a drovers staging post. It has since been lovingly transformed into a unique fine dining retreat complete with a vineyard. br / br / br / br / Original stone buildings have been sympathetically converted into luxury accommodation and fine dining restaurant making Jabajak a bespoke hospitality provider for corporate or personal privacy weddings or romantic weekends or an ideal base to explore the tourist attractions in Carmarthenshire Pembrokeshire and Cardiganshire. br / br / br / br / Come just to eat or treat yourself to a relaxing break in one of Jabajak s rooms or suites. Unwind with a stroll in the vineyard where red kites often visit then relax in the lounge bar and enjoy international wines or real Welsh ales before joining your table for dinner. All our dishes are cooked on the premises using fresh seasonal local produce wherever possible. Our chef will ensure you enjoy dishes of exceptional quality and taste. For complete privacy reserve the truly romantic Nook which nestles in the eaves of the restaurant on its own balcony. A wonderful place for proposals! br / br / br / br / Jabajak is ideal for a private function like a special birthday party or anniversary. You can book the Granary Restaurant to seat up to 12 people or the private Banqueting Suite with its own decked garden area seating up to 60. Jabajak offers excellent bed & breakfast accommodation and a 5 star restaurant in a country vineyard in Carmarthenshire. Secluded yet close to the main A40 it is perfect for fine dining relaxing short breaks or private corporate events. Featuring a garden, Jabajak Vineyard Restaurant & Rooms is set in Whitland and also provides a terrace and a bar. This 5-star hotel offers free WiFi. Every room is equipped with a flat-screen TV with cable channels. Guests at the hotel can enjoy a Full English/Irish breakfast. Tenby is 32 km from Jabajak Vineyard Restaurant & Rooms. Situated in Templeton, Cross Villa features accommodation with free WiFi and access to a garden with a terrace. The bed and breakfast offers a flat-screen TV and a private bathroom with free toiletries, a hair dryer and shower. Breakfast is available each morning, and includes Full English/Irish, vegetarian and gluten-free options. There is a in-house Licenced Tea Room that specialises in numerous Teas, Cakes, Coffees, there is also a Hot and Cold snack menu. Guests can also relax in the shared lounge area. Tenby is 13 km from Cross Villa. Immersed within the beautiful scenery of the Pembrokeshire countryside, and within easy reach of the coast, this modern, purpose-built inn provides the ideal base from which to explore the surroundings. A haven of peace and tranquillity, the Woodridge Inn Hotel is located in the small village of Wooden, near Tenby and Saundersfoot. It is surrounded by beautiful National Trust countryside and enjoys panoramic views of the sea and countryside from some second floor rooms. Easily accessible to all that Pembrokeshire has to offer, during your stay at the Woodridge Inn you can visit beaches, harbours, art galleries, theme parks, animal parks, golf courses, riding stables, castles, museums and nearby islands. Situated on the southern boundary of the Carmarthenshire seaside village of Ferryside, which nestles on the Three Rivers estuary of Carmarthen Bay, the hotel boasts a friendly environment and magnificent views. Overlooking Llanstephan and its ancient castle to the west, and Carmarthen Bay towards Caldy Island and Tenby to the south west, this non-commercial, peaceful and quiet town is the ideal location for a relaxing weekend break in West Wales. Due to its proximity to Carmarthen, Llanelli and other centres, Ferryside is also an ideal corporate meeting place. Incorporated within the hotel is Carmarthenshire's premier private health facility, including a heated swimming pool, hot tub and fully-equipped gym.